All 19 of the Wedgewood Lodge condos for sale are currently owned by one family and are rented short-term - vacations and holidays - in the style of an old ski lodge. They are a townhouse style condo and are typical of those built in Breckenridge in the early 1980s. You can start your search with the Wedgewood condominium listings found below, or discover more about this charming Breckenridge community. Size: 1198 sq. ft to 1708 sq. ft. Amenities: near the Snowflake Lift, 3 blocks from downtown, near free bus route, hot tubs, parking, use of the Upper Village pool. From the traffic circle at the north side of Breckenridge, continue on Park Ave. for about 1.5 miles to Four O’clock Road, turn right and go up Four O”clock to 535. 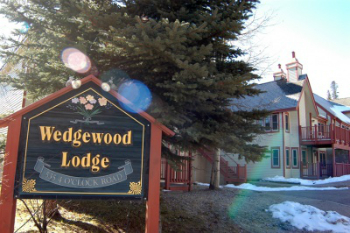 Wedgewood Lodge offers a classic ski-lodge feeling in a convenient Breckenridge location. Contact us for more information.